Members of FWN who are also board members of Feed the Hungry Washington DC are on the ground coordinating disaster relief operations—in-person-distribution of goods and assistance. 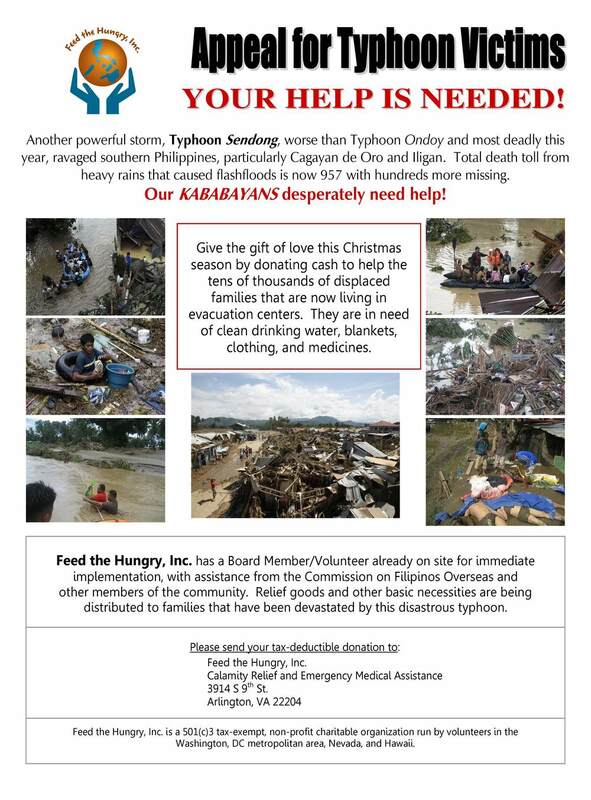 Many more are flying to the Philippines on December 27, 2012 to help. If you’re able, please consider donating a portion of your holiday gift budget to help especially our Filipina sisters victims and survivors who are mothers, grandmothers and colleagues. Click here to donate at www.feedthehungryphil.org which will be processed via PayPal. If you’re mailing a check, please indicate “FWN” on the memo line so we can acknowledge your donation or please click here to post your support. Maraming salamat and our warmest wishes for the holiday season. Latest update concerning the typhoon and relief operations, go to the Philippine National Disaster Risk Reduction Management Council’s (NDRRMC) website at www.ndrrmc.gov.ph. Click here to download for Philippine Consul General Jun Paynor’s Letter of Appeal.